Incredible Korg Sounds in Under 10 Pounds! Loaded with the killer soundset, effects and sequencing tools found on the KROSS 2 88-key, but with a lighter synth-action keybed, the Korg KROSS 2 61-key synthesizer workstation redefines "portable"! Battery-powered and weighing less than 10 pounds, the 61-key KROSS just begs to be taken out and played. Its powerful sound engine delivers hundreds of convincing, easy-to-use instrument presets, drum samples, and effects, making the KROSS keyboard the kind of performance synth you can just turn on and play without having to do any major tweaking or sound design work. It's also loaded with tools like a built-in step sequencer derived from the Korg Electribe, 16-track MIDI sequencer, drum track, and a pad sampler that will transform your performance on stage and in the studio. Compared with the original KROSS, the KROSS 2 contains more PCM memory, more built-in sounds, and more polyphony, allowing more notes to be played simultaneously. The wider world of available sounds in the KROSS 2 allow you to dial in the exact sound you need quickly, and expanded memory gives you plenty of room to save your user presets. The KROSS 2 now also includes user sampling and sample editing, plus 16 trigger pads for on-the-fly sample triggering. These new and expanded features help narrow the gap between the KROSS and much more expensive keyboards. Some keyboards offer a thousand instrument sounds, and some offer a hundred. With 496 multisamples (plus 1014 drum samples), the KROSS finds a happy medium. You get essentials like grand pianos, electric pianos, strings, organ, and synth sounds, as well as some more exotic fare, such as vintage tape sampler, toy piano, and accordion sounds. The KROSS also comes loaded with must-have dance and electronica sounds that are hard to find in this price range. No matter what kind of music you play, the KROSS has a sound (or ten) to back it up. You can use the Sound Selector to find the sounds you want, and use the favorites function to organize them for your next performance. The KROSS's EDS-i sound engine allows you to use seven effects simultaneously (five insert effects plus two master effects), giving you plenty of creative control over your sounds. Essential effects such as delay, reverb, chorus, flanger, and rotary speaker are included, as are some unexpected extras, like amp modeling, vocoder voice, and more. 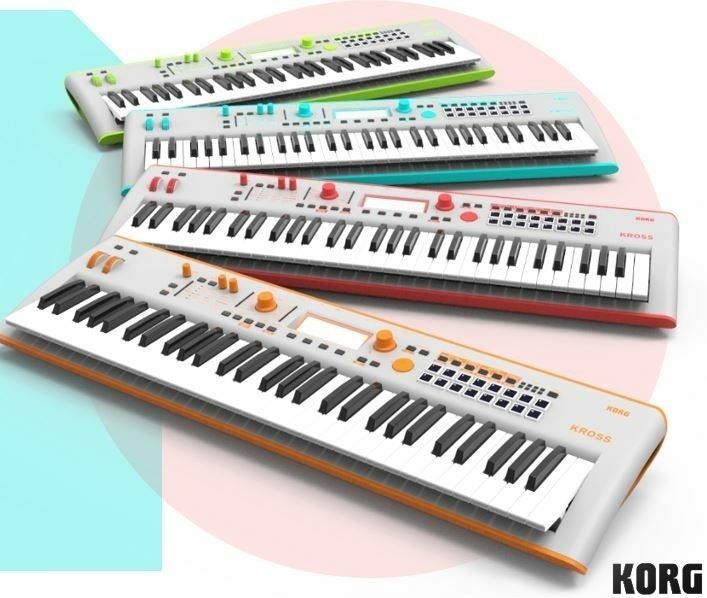 Korg's KROSS 2 workstation includes no fewer than 134 high-quality effects. It's easy to select sounds, make beats, and create full songs on the KROSS. Its clean layout puts everything you need front and center: volume, instrument/category selector, FX buttons, simple audio recorder functions, split/layer, step sequencer, drums, sample pads, and so forth. The Electribe-style step sequencer gives you hands-on drum editing, and a bright LCD screen lets you see and edit your beats in real time. Need to capture a guitar melody, vocals, or a quick idea for a song? No problem -- do it directly on the KROSS with the keyboard's built-in stereo audio recorder with mic and line inputs. You can connect instruments or other audio sources and record straight to SD card media, and then incorporate your new audio with the sounds already available on the KROSS. And of course, there's a 16-track MIDI sequencer as well. Great for mobile musicians, the Korg KROSS can be powered either by the included AC adapter or 6 AA batteries. That means the instrument is at home in any location -- even a park bench with no electrical outlets in sight.